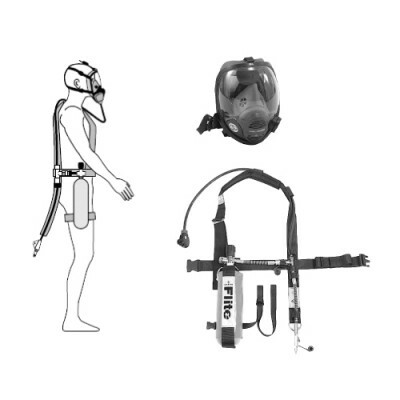 Find here the essential information on dioxygen (O2) or oxygen: characteristics, effects on health, detection devices & systems – O2 monitor or rather oxygen depletion sensor – and respiratory protective equipment (self-contained breathing apparatus and supplied air respirator). Dioxygen (O2) – which is most commonly known as oxygen – is a gas naturally present in the atmosphere at around 20%. It is essential to almost any form of life on Earth. This highly reactive gas can easily produce compounds (particularly oxides) from elements except for noble gases like helium or neon. Oxygen (O2) is a colorless, odorless and tasteless gas that composes breathing air at 10.9%. 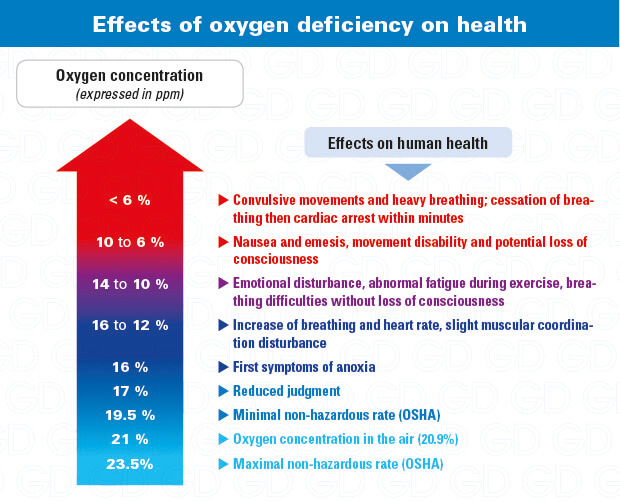 In contrast to the great majority of gases, the lower the oxygen (O2) concentration is, the higher are the risks for health. In the medicine field, O2 is inhaled primarily in case of asphyxia, intoxication to carbon monoxide, or to treat acute pulmonary edema… This gas is not measured in ppm but in % volume. 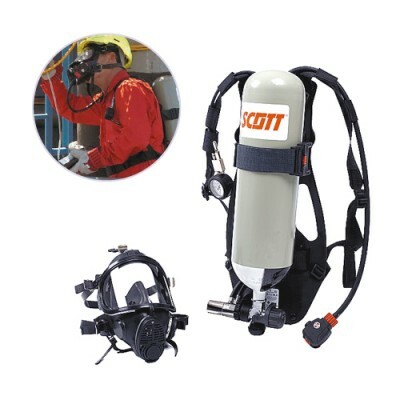 As oxygen is colorless and odorless, this gas cannot be detected without proper equipment. 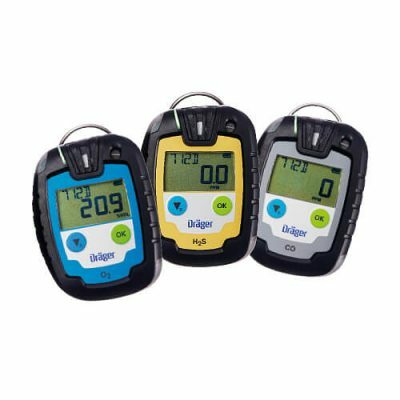 Only an O2 monitor (oxygen depletion sensor) can accurately measure concentrations of oxygen in the air. Thus it is recommended to use an oxygen detection device in % volume. The GMA Pro is an oxygen rate monitoring system. 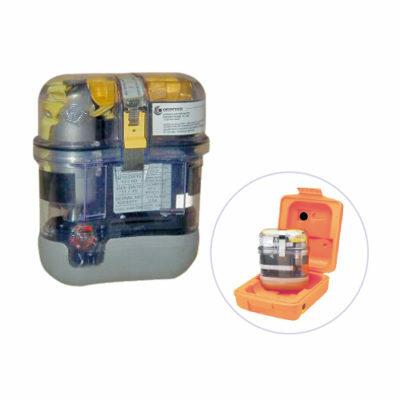 It is designed to alert in case of any danger that could occur in potentially poorly oxygenated areas (presence of asphyxiating gas or nitrogen cylinders). Easy installation and use (3 buttons and large LCD display). Electrochemical sensor measurement (0-25%/vol, resolution 0.1%, 2 years lifetime). LED visual and 85dB audible alarms, 2 relays. Stainless steel sensor location, EN 61000-6-3, EN 61000-6-4, EN 50270 type 1 & 2 electromagnetic compatibility. Housing dimensions : 13.5 x 24.7 x 9.5 cm – weight : 900 gr. 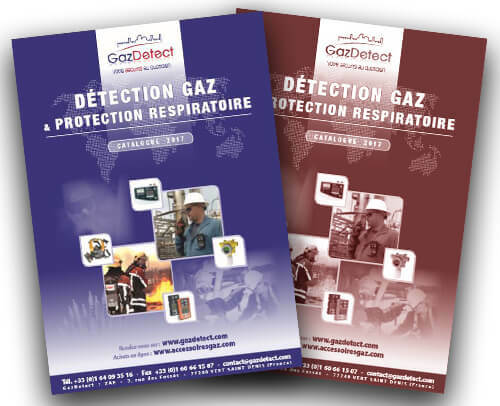 Disposable gas detector for SO2, CO, H2S or O2 hazardous concentration levels monitoring. Pac® 6000 features a 2 years maintenance free lifetime. Easy and comfortable use, high accuracy measurements. LED visual, audible (90 dB) and vibrating alarms. Lower purchase and operating costs. ATEX, CE, IECEx and cCSAus compliant. 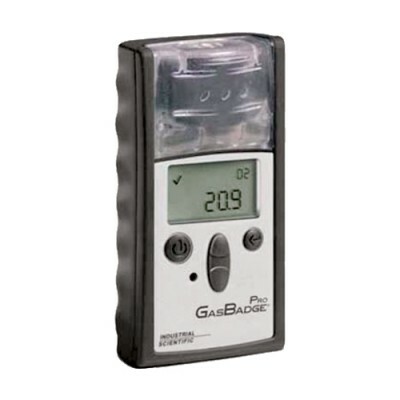 Designed to precisely monitor carbon monoxide (CO), hydrogen sulfide (H2S), hydrogen dioxide (SO2) or oxygen (O2), the disposable portable gas detector Pac 6000 alerts of gas presence with a very efficient response time and strong performances. This disposable detector can fit in any situation with an operation temperature between -40°C and +55°C. The Pac 6000 is precise and reliable in every situation, even in the toughest conditions. 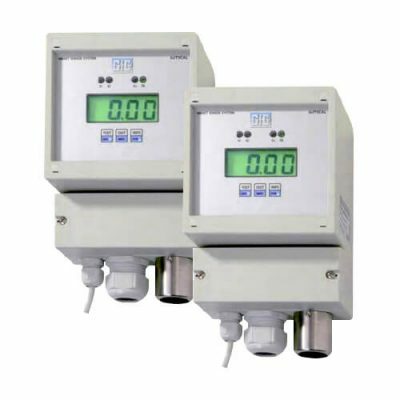 Thanks to its extended measuring range, the Pac 6000 provides optimal safety and efficiency with for example CO concentrations measurements from 1 up to 1,999 ppm. 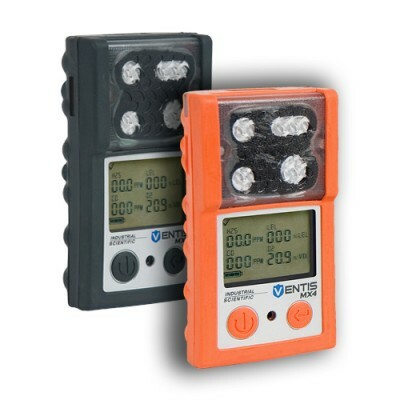 With its robust design, this disposable gas detector ensures continuous safety up to two years with virtually no maintenance required. The large backlit display indicates gas concentrations and the battery capacity. In addition the Pac 600 logs concentrations and any alarm event in its internal memory. Its two bright, flashing 360° LEDs and its 90 DB acoustic alarm ensure that the alarm is easily seen from all sides. With an oxygen or a carbon monoxide sensor, the Pac 6000 has two additional alarm thresholds as a supplement to the standard settings. Each version of the Pac 6000 features a reliable and sustainable filter that features IP 68 protection. When the filter is soiled, it can be easily and quickly replaced. 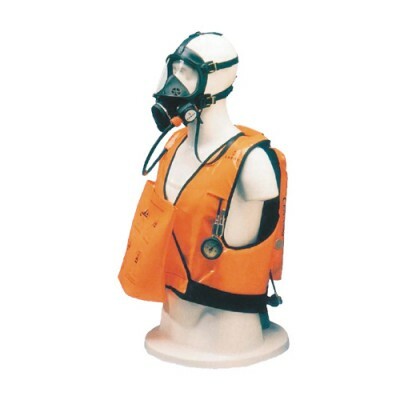 As any air purifying respiratory protective device is inefficient in case of oxygen deficiency, it is advised to wear a self-contained breathing apparatus or a supplied air respirator for long-term interventions.